With an early tip and no student section, the energy in The Schott didn’t quite pick up until Thad Matta called upon his bench, which led Ohio State to an 84-53 victory, today, over Nebraska. The Buckeyes held a tenuous grasp on the lead, up only three points with less than three minutes to play in the first half. They were somewhat sluggish in the early going, missing open threes, getting out-rebounded and asking junior guard Shannon Scott to carry the load offensively. Then, OSU closed the first half with a 7-0 run. "It was huge because we went into half knowing we had a ten point lead and especially [because] we played the last four minutes with that energy," sophomore guard Amadeo Della Valle said. "We did a great job to finish the half and that led to a great start to the second half." The offensive explosion carried into the second half, with Ohio State (15-0, 2-0) shooting 58.3 percent and outscoring Nebraska (8-6, 0-2) by 21. 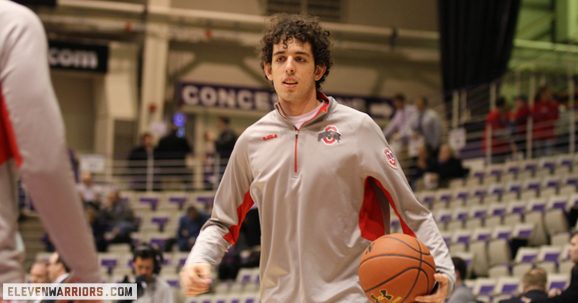 Della Valle led the way off the bench and for the team, overall, with 15 points on five shots. Head coach Thad Matta is excited by Della Valle's contributions. "I know how hard he works and how badly he wants the team to do well," Matta said, in his post-game press conference. "He wants to contribute and be a part of what we are doing. He’s diligent in his work and he is doing exactly what we need him to do for us." Five Buckeyes finished in double figures, including another bench player, freshman forward Marc Loving. He had a career high 13 points and went to the free-throw line eight times. Ohio State also had 38 total points from the bench, a season high. "Our energy off the bench can affect the game in a major way," Loving said. "Whether it's scoring, rebounding or – like today – Amadeo had a lot of deflections on defense, that added a little, extra spark to the game and got us going." Scott, Junior forward LaQuinton Ross and junior center Amir Williams were the other three players in double figures, led by Scott’s 13. Entering the game in better health, Williams encountered foul trouble again, but was able to make a more meaningful contribution. He nearly missed the Purdue game due to an allergic reaction in his throat. Still, after sprinting coast-to-coast for a block that preserved a 10-0 run in the early part of the second half, he did look rather winded. Forward Adreian Payne will push Williams’ limits in Ohio State’s next game, at No. 5 Michigan State, Tuesday night. "Collectively, we have a great mindset going into our next game," Loving said. "Michigan State is a very, very tough team and we have to bring our A-game."